SAP and eSpline hosted for the first time in the USA a SAP Product Configurator Info Day in Downers Grove, IL on February 9, 2012. This type of event has been very successful in Europe 2011 with overflow attendance and held in Germany several times and also in Switzerland. 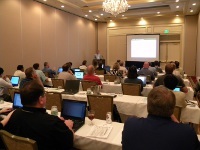 The Chicago event was a full day event with speakers from SAP, several SAP customers and eSpline. eSpline's Avenue Translator was introduced and demonstrated at the 2011 BigMachines Conference in Chicago October 23, 2011. What does Avenue Translator do? It exports a SAP VC product model, translates the Variant Configurator rule patterns, tables and BOM to XML and then converts to BigMachines rules, tables and logic and imports to BigMachines. Table entries, characteristics, preconditions, constraints and class hierarchy are translated. One conference attendee from a company using both SAP and BigMachines said "...the cost will easily be paid for the first year. You just made my year.". eSpline is offering any SAP customer using the SAP Variant Configurator or IPC a Health Check Analysis Report. What does this mean? By' downloading a SAP VC/IPC product model eSpline will process this model and list any and all issues with the model. The report is comprehensive and lists issues in nine (9) separate categories. Many companies have taken advantage of this and found it very useful. The new VC users have found it extremely useful to learn the Best Practic syntax and ways to improve performance. Others have said that it was very helpful identifying compatibility issues between VC and IPC. You will also receive a complimentary Documentation of your VC/IPC model using the eSpline Model Viewer solution. The eSpline SaaS portal, Avenue / Managing VC, has been certified by SAP. The Managing VC solution enables for the first time a SAP Variant Configurator or IPC product model to be downloaded and saved outside the SAP environment using standard SAP functions. Here SAP VC and IPC models can be documented and viewed in an easy-to-read, navigable PDF or HTML document. One of eSpline's customers' first comment was "OMG, look at this!" when he saw the first model report.